Yamaha will soon be launching the MT-15 in India. The motorcycle was spotted a couple of times already while testing on Indian road. Recently, Yamaha even showed a teaser video of the upcoming motorcycle which certainly confirms the fact that they indeed will be launching the naked streetfighter within the month of March 2019 in India. Recently IAB has got their hands on a ‘Type Approval’ certification document which contains all the important specification details and numbers of the soon to be launched Indian spec MT-15. According to the ‘Type Approval Certificate’, registered with the CMVR (Central Motor Vehicle Rules), the upcoming MT-15 will be powered by a BS-IV compliant 155.1, SOHC, liquid-cooled, 4-valve engine. This is the same engine which also powers the current generation YZF-R15 v3.0 which is already on sale in India. 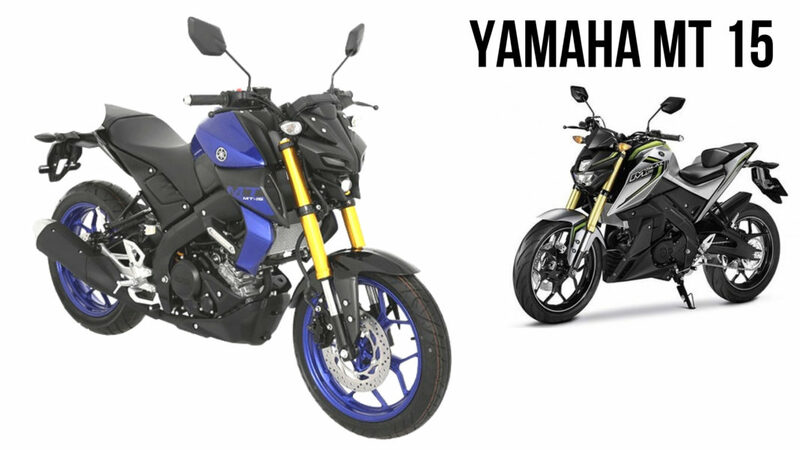 The engine features Yamaha’s VVA (variable valve actuation) and will produce the same 19.5 Bhp of peak power at 10,000 rpm and 14.7 Nm of peak torque at 8,500 rpm. The engine will be paired to a 6-speed gearbox. 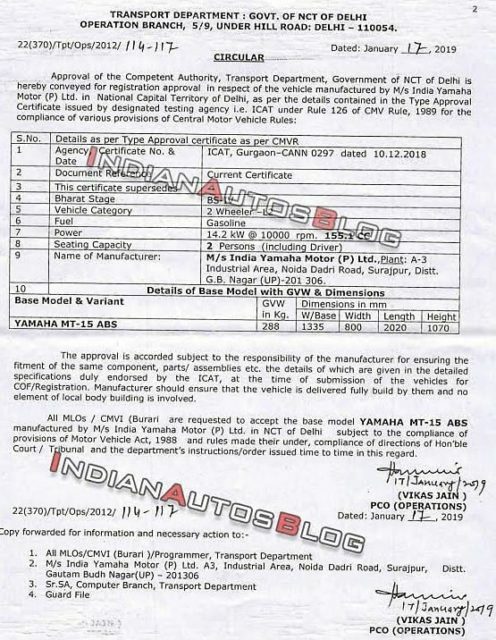 The leaked document further also reveals that the Indian spec MT-15 will measure at 2,020 mm in length, 800 mm in width, 1,070 mm in height and will have a wheelbase of 1,335 mm. The gross vehicle weight of the Indian spec MT-15 will be 288 kilograms. The motorcycle will also feature telescopic front forks which replaced the USD units available in the International spec MT-15. 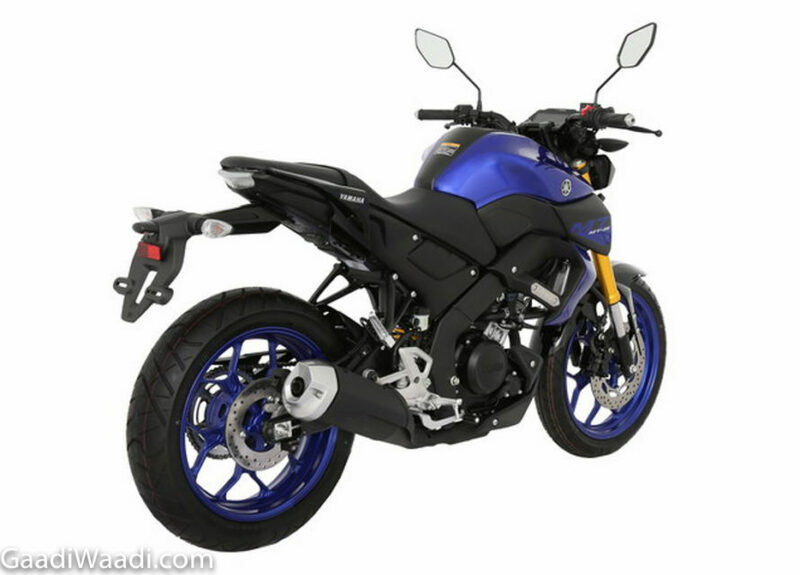 It will also get Yamaha’s R15 V3.0 sourced alloy wheels and MRF tubeless tires. Another major change that Yamaha made to the Indian spec MT-15 is the box-type swingarm which replaced the aluminium unit of the global model. These changes were made deliberately in an attempt to keep the overall prices down and competitive. Fortunately, the Indian spec MT-15 will retain the similar kind of styling as seen on the International spec model. The MT-15 will retain its signature bug eye styled LED headlamp, all, digital instrument cluster, muscular looking fuel tank with extended shroud etc. As far as the prices are concerned to expect the upcoming MT-15 to be priced at around Rs 1.20 Lakh (ex-showroom).